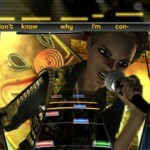 Did you get Rock Band over the holidays and are frustrated with the “unlocking” of the songs? into “Rock Band 2,” which includes such options as a long-needed no fail mode — and a secret song-unlock code. The catch? You need to know the code! But we’ve already figured that out for you. You simply input the original “Rock Band” unlock code — Red, Yellow, Blue, Red, Red, Blue, Blue, Red, Yellow, Blue — in the game modifier screen.